With a population of 80,000 people and at an elevation of 3,840 meters, Shigatse is the 2nd largest town in the Tibetan Autonomous Region. As the seat of the Panchen Lama and the former capital of Tibet, Shigatse is a must visit stop on the road from Lhasa to Everest Base Camp. 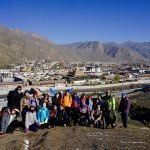 You can spend a whole morning walking the Tashilunpo Monastery in Shigatse and then doing the pilgrimage kora around the monastery. If you have the time, spend 2 nights in this town and get refreshed before you head out into the wild highlands of Mount Everest Base Camp. The drive from Lhasa to Shigatse (via Yamdrok Lake and Gyantse) is a total of 355 km. It is best to break this drive up into two days, spending the first driving day (260km) from Lhasa to Yamdrok Lake to the Karo La Glacier to Gyantse. And then the second day driving 90km from Gyantse to Shigatse. Lanzhou is the capital city of Gansu Province in northwest China at an elevation of 1518 m (4980 ft). The Yellow River runs through the city and it is definitely worth an afternoon of your time to rent bicycles and cruise along the river for 2-4 hours. The city is the transportation and telecommunication center of the region and is the largest city in western China. Covering an area of 1631.6 square kilometers (629.96 square miles), it was once a key area of trade on the ancient Silk Road. 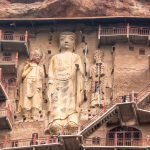 Today, it is a hub for tourists as they begin their adventures out into the Silk Road, with the Maiji Caves to the east, the Bingling Temple Grottoes to the west, Labrang Monastery to the south and the ancient cave paintings of the Dunhuang Mogao Caves to the north. With mountains to the south and north of the city and the Yellow River flowing from the east to the west, Lanzhou is a beautiful modern city with both the modern ammenities of a large city and the charm of southern cities. The downtown comprises five districts: Chengguan, Qilihe, Xigu, Honggu and Anning. Among them, Chengguan District, situated in the eastern part of the city, is the center of politics, economy, culture and transportation. Anning District, in the northwest of the city, is the economic development zone as well as the area where most colleges are located. As a transportation hub, Lanzhou connects western and central China. Flights are frequent from many large cities such as Beijing and Shanghai. With three train stations, it is the termination of the Longhai Railway (Lanzhou – Lianyungang Railway), an important east-west rail route in China. Bullet trains to Urumqi also originate from this city. Owing to its location on the Silk Road, local cuisine maintains characteristics with an Islamic influence. Locally sourced grass fed beef and lamb are common to most dishes. In fact, Lanzhou Beef Noodles or 兰州牛肉面 are famous all across China and most bowls are dirt cheap and very hearty at around 10-12 RMB. In addition, there are many local snacks that we recommend for those looking to try something new such as Niangpi, Hui Dou Zi (Gray Bean) and Fried Noodles. Although many restaurants serve Islamic food, various cuisines such as hot pot and western food are also offered for travelers. With KFC, Starbucks, Burger King, and a host of western restaurants, you will have no problem finding something you will like to eat. As the beautiful capital city of Tibet Autonomous Region (TAR), Lhasa is situated in the south central part of the region, on the north bank of the Kyichu River (a tributary of the Yarlung Zangbo River) in a valley surrounded by imposing mountains. The altitude of Lhasa is 3,656 meters (11,995 feet) above sea level. Located at the bottom of a small basin surrounded by the Himalaya Mountains, Lhasa lies in the heart (both physically and spiritually) of the Tibetan Plateau with the surrounding mountains rising to 5,500 m (18,000 ft). The air here only contains 68% of the available oxygen one would find at sea level so be prepared to walk a little slower (and with heavier breath) and to pop a few Ibuprofen for the high altitude headache that you will probably have your first night in Lhasa. Make sure you drink lots of water and try to stay away from coffee and alcohol your first few nights in Lhasa. Also get lots of rest and take things slow on arrival here because you want to acclimatize slowly. Generally the period from March to October is the best time to visit with March, April, October, and November offering clearer skies (and thus better views of Mount Everest) and less Chinese tourists. Since the city is located at such a high altitude most tours to Lhasa and Mount Everest will usually include 3-4 days to acclimatize in the city before departing for wilder, higher places. Generally speaking, the temperatures in the day can be quite comfortable and spring-like under the bright sun and then nights are quite chilly to cold, often below freezing in the spring and fall. 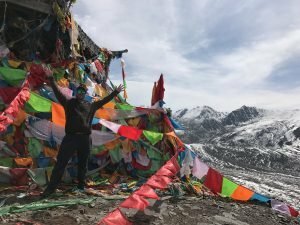 You are definitely going to want to bring your thick down puffy jacket, especially if you are planning an excursion from Lhasa to Mount Everest Base Camp at 5,200 meters (17,060 feet). Lhasa has a population of roughly 1 million people, and about half of this population is comprised of Han Chinese while the other half consists of Tibetans (there are also a few Hui Muslims here that make up a small percentage of town and there is an active Mosque in the Tibetan quarter of town). 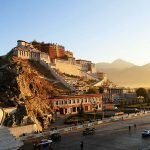 Although the Tibetan quarter is very historic with ancient stone architecture (this is definitely where you want to stay and spend most of your time) Lhasa is quickly developing and the areas outside of the Tibetan district are starting to look more and more like a regular Han Chinese city. The large percentage of tourists that visit this city are mostly Han Chinese and there is a lot of infrastructure that supports this growing population, including massage parlors, outdoor gear shops, karaoke bars, fancy car dealerships, and Sichuan style restaurants. With all the recent development, as long as you have given your bank proper notice, you should have no trouble using your international credit card here at ATM’s in large banks such as ICBC, Bank of China, or China Construction Bank. In fact, more than 95 % of tourists to Tibet are Chinese. 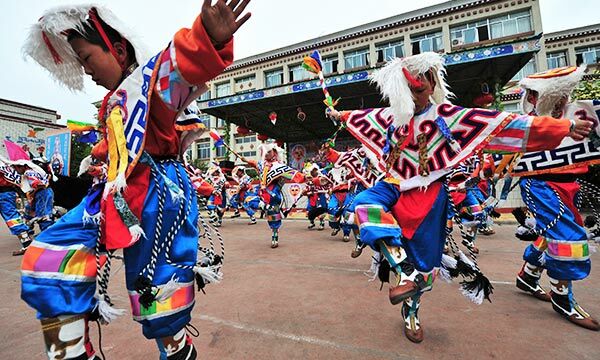 In 2014 alone, more than 15 million tourists visited Tibet Autonomous Region [TAR], a number up more than 20 percent from the 2013 statistics, according to the local government. In 2014, a record 3.15 million people arrived by air to Lhasa and most of the rest of the tourists came by the world’s highest train, the famed Qinghai-Tibet Railway. The China Daily reported the numbers of a regional tourism bureau report: “Lhasa alone saw more than 9.25 million tourists and reaped tourism revenue of 11.2 billion yuan ($1.79 billion)”. Lhasa was an important holy city even before Buddhism arrived in Tibet in 642 A.D., and until the 1950s half of its residents lived in monasteries. In the 1940s, Lhasa would have been best described as a village. Its 600 traditional buildings were dwarfed by the massive monasteries and palaces that were home to 20,000 monks. Between 1950 and 2000, the population of Lhasa increased 17 times to around 200,000 and has increased 5 times since then. The expansion is mainly the result of arrival of large numbers of Han Chinese but has also been affected by a migration of Tibetans from rural areas to Lhasa. The Potala Palace and the Barkhor Street centered in Lhasa city, north to the Sera Monastery, west to Duilong Deqing county. Viewed from the overlooking the Lhasa city, Post and Telecommunications Building, News Building, Lhasa Hotel, Tibet Hotel and various buildings dotted. Standing on top of the Potala Palace to overlook the Lhasa city, the Lhasa city is full of pieces of new building hidden in the trees, and Barkhor Street surrounding has waving prayer flag. Here densely covered a national style of houses and streets, gathered from all over the Tibetan people, and many of them are still in Tibet traditional clothing. It seems that prayer wheel and prayer beads never leave their hands which clearly show that Buddhism has become a way of life in fact. All Foreign travelers to Lhasa and the Tibetan Autonomous Region have to join a tour group pre-arranged by a registered travel agency. You can not enter the this area as an idenpendent, free-wheeling tourist and all your travel and hotel bookings must be made in advance by a travel agency accordingly. Because of this regulation, you will need to receive your Tibet Travel Permit BEFORE you board your plane or train into Lhasa. Your travel agency will send this to you (sometimes to a Chinese hotel in Beijing or Chengdu where you are staying before your tour) to enter that region. Currently there are two options to reach this mysterious high land, either by plane by train. The bus station in Lhasa will not sell tickets to foreigners and bus drivers will not allow foreigners onto buses that go outside of Lhasa. All travel within the TAR for foreigners must be booked in private vehicles. 1. Taking an airplane is the most comfortable, quick method of travel to Lhasa, but this offers less time for you to acclimatize to the altitude of Lhasa. Lhasa Gongar Airport (LXA) is a one hour drive from downtown Lhasa, or about 62 kms (38.5 miles). There are over 40 flights to/from major domestic cities that fly in and out of LXA including Beijing, Chamdo, Changsha, Chengdu, Chongqing, Dazhou, Diqing, Fuzhou, Golmud, Guangzhou, Guiyang, Hangzhou, Kangding, Kunming, Lanzhou etc. 2. Taking the train to Lhasa is a fabulous new option, giving the opportunity to see previously unseen mountain scenery on a train that is built on over 550km of permafrost. With the opening of the Qinghai-Tibet Railway on July 1st, 2006, more and more visitors opt to get a soft sleeper or a hard sleeper bed on the train to experience the lay of the land and the incredible scenery from their train window. Getting to Lhasa from Beijing by train will be a once in a lifetime experience for you. 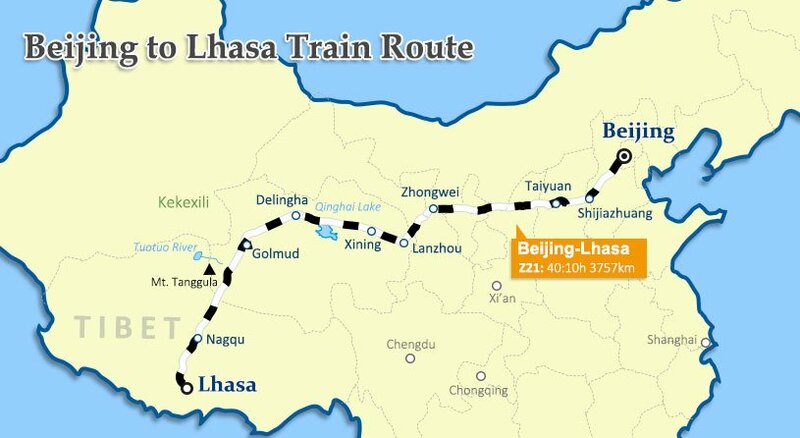 The Beijing –> Lhasa train (Train # Z21), takes about 40 hours and 30 minutes, runs for 3,757 km, and crosses 8 total provinces from the plains of northeast China to the worlds’ highest plateau. 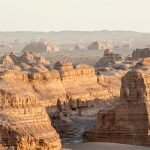 Some of the highlights of the scenery along the way include glimpses of the Gobi desert, the 6,244 meter (20,485 ft) high snow-capped Yuzhu Peak, and the lofty Tanggula Mountain. And, of course, there will LOTS of open high-altitude grassland (and maybe even some wildlife roaming about). All I can say about this journey is for you to make sure you pack lots of snacks. I have friends who pack wine and cheese every time they ride a train in China and I think they are really onto something by preparing so well for the occasion! Mount Kailash is a high altitude behemoth in western Tibet and provides some of the most stunning trekking in all of Central Asia. The highest point of the 3 day trek is 5,636 meters. For this trek you are going to need some serious cold weather gear. But at the same time, because you will be sleeping in tea houses that provide food, beds, and blankets there are definitely some things you will NOT need to bring. 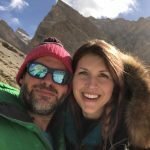 Here is the packing list I recommend for anyone doing the trek in 3 days. As always, the less stuff you bring, the more your back and legs will thank you! 1 x day pack (20-30 liters) – If it is bigger than 35 liters you are carrying too much stuff! Most people have never heard of Qinghai Province. Located on the northeastern corner of the Tibetan Plateau and with a total population of only 5.6 million people, Qinghai is a wide open, high altitude land of nomads and snow leopards, Tibetan cowboys and wild yaks. 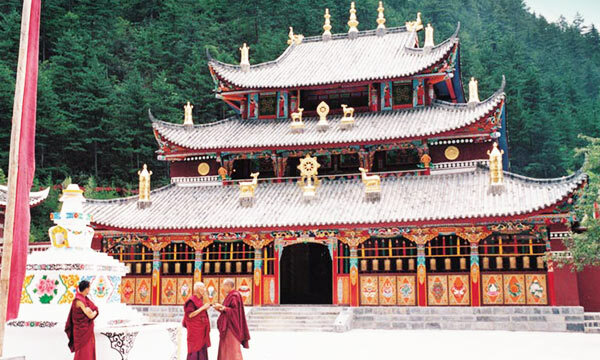 Qinghai also holds a wide array of Tibetan Buddhist monasteries and mosques to dazzle the eye. Despite its relatively small population, this is a massive land area with 722,000 square kilometers in total area, making it bigger than the individual countries of France, Afghanistan, Thailand, or the whole of the United Kingdom. Qinghai Province is the source of China’s two largest rivers, the Yangtze River and the Yellow River. This unique Montana-like Plateau offers towering mountains, red rock canyons, and is full of meandering rivers and alpine lakes. 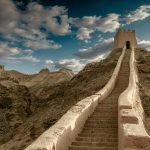 Want to know where to travel in Qinghai? This is definitely the place to get off the map and experience #AdventureTravel at its finest! Sichuan cuisine is a style of Chinese cuisine originating from Sichuan Province in Southwest China. If you are a newbie to this kind of food, Sichuan dishes will surprise you with their bold flavor and spiciness, mainly from the large use of garlic and chili peppers, as well as the minty and slightly numbing flavor of the famous Sichuan pepper. Our advice is to be bold and give it a try. In this article we will offer some insight on the most popular and delicious Sichuan snacks! Liangfen is a common but quite popular Sichuan snack which is served cold. 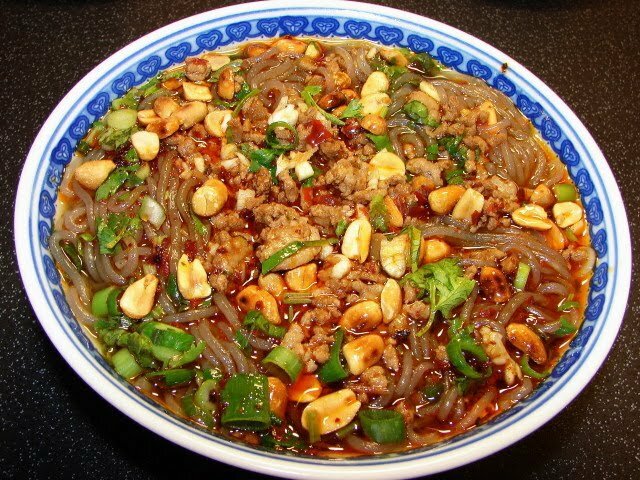 In fact, the name Liangfen simply means “cold noodles”. It is generally a white, almost translucent, thick starch jelly, made from mung bean starch, but it also can be made from pea or potato starch. The starch is boiled with water resulting in a viscous paste that is spread on a pan in the form of a sheet and then cut into thick strips. The liangfen strips are then served cold in a bowl with sesame paste, soy sauce and chili oil, seasoned with pieces of carrot, chopped green onion, fresh coriander and crushed garlic. This snack although served cold will warm up your body due to its spiciness and rich flavor. It is really an amazing combination of hot and cold in one dish. 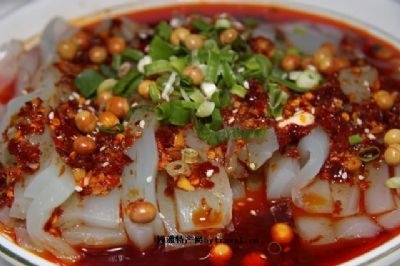 Suan La Fen, aka “Hot and sour sweet potato noodles”, is a well known Sichuan street snack. The main ingredient behind this snack is the thick sweet potato noodles which are much chewier than common flour-based noodles or the instant noodles you may have eaten in college. These noodles are served in a warm stock of either pork bone or chicken bone and is seasoned with tones of pre-fried garlic in chili oil, vinegar, sesame oil, light soy sauce and the Chinese five spices powder. The topping varies from red braised beef, minced pork sauce, or red braised large intestines combined with chopped green onion, fried peanuts and pickled mustard. You can find this snack in almost every city in China, so just give it a go. 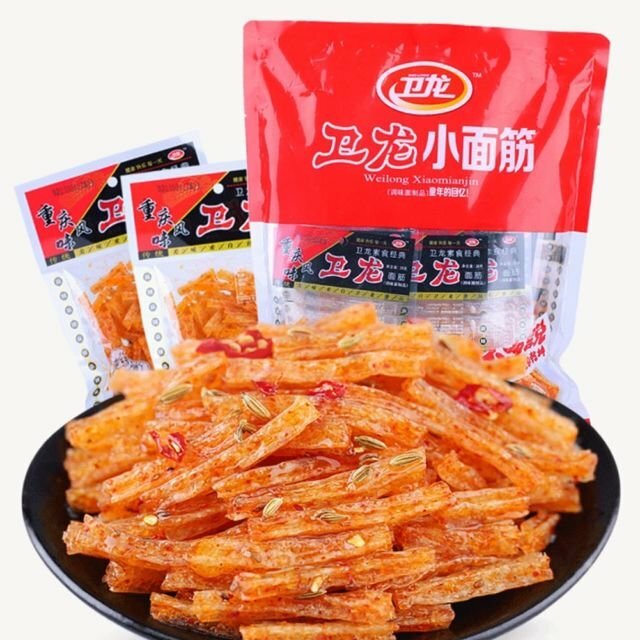 La Tiao is one of the most popular snacks in China and it got its international fame in 2016 when this snack was haphazardly featured in a BBC documentary about Chinese New Year celebrations. Apparently the 2 commentators were eating this snack during the filming of the documentary and the audience picked up on this little detail in a big way! Now it is becoming an international sensation! This snack consists of tofu skins fried in a mixture of water, soy sauce, fresh ginger, sugar, salt, Sichuan pepper, chili powder, myrcia and Chinese fennel species. The end result is similar to potato chips but much richer in taste and pretty spicy. Although very delicious, this snack is rich in gluten, so if you’re gluten sensitive you might want to stay away from this one. This is a very traditional snack that is commonly given as a gift amongst Chinese people. If you are wondering what souvenir to bring your father or uncle – look no further! 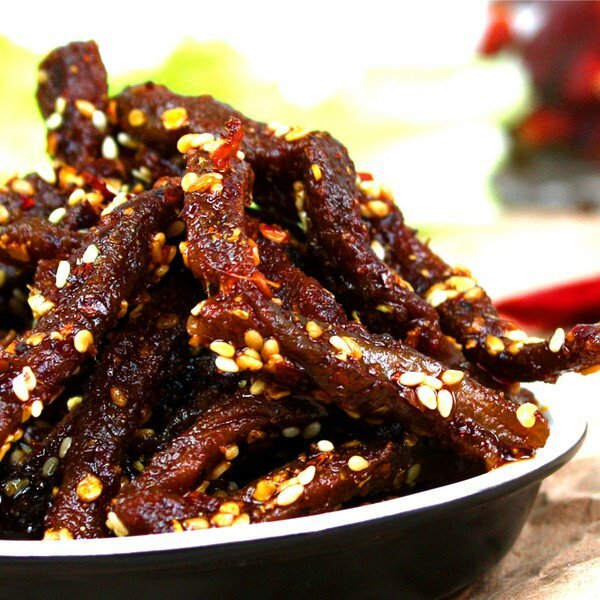 Niu Rou Gan explained in simple words is a spicy dry beef jerky, however there is more to it. This is so much more than just Jack Links jerky! The beef meat undergoes a three step process: boiling, stir-frying, and drying. During the first two steps the meat will be treated with diverse spices like Sichuan pepper, bay leaves, anise, cinnamon, fennel seeds, cardamom, sesame seeds, chili and many more. Therefore, when slowly chewing on this snack you can slowly taste the full spectrum of flavors derived from the spices. This one is especially good if you can manage to find it made from yak meat! The yak meat is a little richer than cow in taste and usually is 100% grass fed straight from the high open plains of the Tibetan Plateau! The world knows this as a steamed bun, but China knows this as Baozi. This snack- often eaten as a breakfast staple by most local Chinese- is a simple but delicious bread-like bun, filled with meat or vegetables and then steamed, usually in a wooden wicker basket. 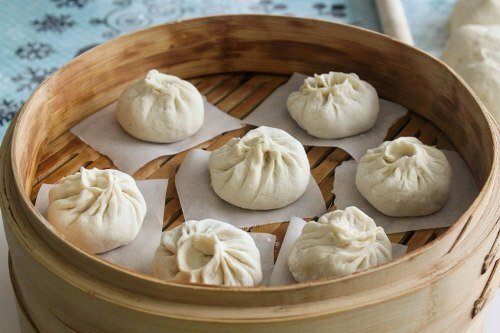 The meat baozi is usually filled with a mixture of ground pork and sliced pork belly, as the extra fat ensures that the filling remains mouthwatering and juicy. 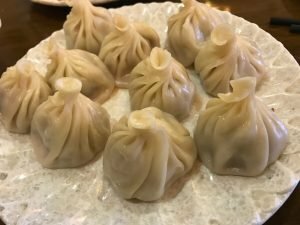 The vegetarian baozi on the other hand is filled with various combinations of mixed savoy cabbage, shiitake mushrooms, carrots, and rice all seasoned with soy sauce, oyster sauce, sesame oil, salt and sugar. In the end, every one has their own favorite baozi, as there is a wide selection of it. Personally, I could eat carrot and potato baozi all day long! Dawu is a great place to launch a road trip into either the Nyenbo Yurtse mountains (to the south) or the glaciers of the Amnye Machen range just to the west. It is one of the last outposts of civilization and with a fantastic monastery on the edges of town, it would be easy to spend 1-2 days here acclimating and filling up with good, hot food. It used to take about 10 hours to drive the horribly bumpy dirt road from Dawu to Huashixia 花石峡 to drive past the glaciers of Amnye Machen. But now with a brand new highway, the drive takes about 4 hours through 2 new tunnels that pierce right through the heart of the snowy mountains. The tunnels have taken away some of the rustic beauty of the formerly adventurous drive whereas you used to drive over 4,500 meter mountain passes covered with prayer flags just at the base of the Amnye Machen glacier. But they have also made the drive much more reachable and certainly much safer than the dangerous icy passes used to be. Be warned of Chinese construction: it happens fast and when it does it is not always marked well. In driving from Huashixia and Maduo to Dawu in November 2017, it took me about 1 hour to find the entrance to the highway to Dawu just 15km north of Huashixia among a confusing new construction site of circling “cloverleaf” highway ramps. Also note that as of November 2017 that none of the off ramps between Dawu and Huashixia were open, in particular Xueshan 雪山, which leaves the traveller with few options for lunch stops or gasoline. Make sure you fill up your gas tank as you depart Dawu because you might not be able to get gas for another few hours along this beautiful, high altitude road. 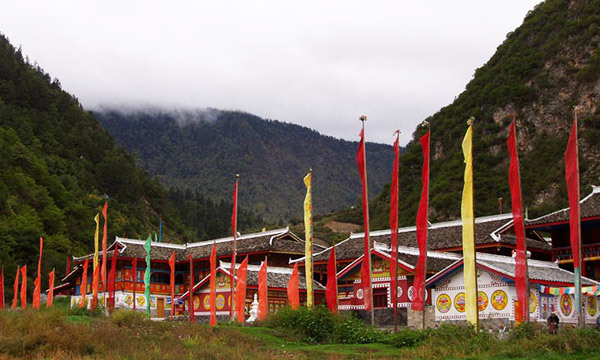 Golog (or Guoluo) Tibetan Autonomous Prefecture (Chinese: 果洛藏族自治州; Tibetan: མགོ་ལོག་བོད་རིགས་རང་སྐྱོང་ཁུལ་), is an autonomous prefecture occupying the southeastern corner of Qinghai province, in western China. The prefecture has an area of 76,312 km2 (29,464 sq mi) and its seat is located in Maqen County in Dawu. Golog Prefecture is located in the southeastern part of Qinghai, in the upper basin of the Yellow River. Gyaring Lake and Ngoring Lake on the western edge of the prefecture are considered to be the source of the Yellow River. However, these lakes do receive water from rivers that flow from locations even further west, in Qumarleb County of the Yushu Tibetan Autonomous Prefecture. The lay of the land of the prefecture is largely determined by the Amnye Machen mountain range (maximum elevation 6,282 m), which runs in the general northwest- to-southeast direction across the entire prefecture, and beyond. The existence of the ridge results in one of the great bends of the Yellow River, which first flows for several hundreds of kilometers toward the east and southeast along through the entire Golog Prefecture, along the southern side of the Amnye Machen Range. The Yellow River continues until it reaches the borders of Gansu and Sichuan Province and then turns almost 180 degrees and flows toward the northwest for 200–300 km (120–190 mi) through several prefectures of the northeastern Qinghai, forming a section of the northeastern border of the Golog prefecture. Several sections of the Sanjiangyuan (Source of the Three Rivers) National Nature Reserve are within the prefecture. Guoluo Airport Or Golog Airport (Chinese: 果洛机场) is a small airport that has been recently under construction in southeastern Qinghai Province outside of Dawu town. The airport is in the Caozichang (草子厂) on the Dawutan Grassland (大武滩草原). Construction Began on 14 September 2012 with an estimated total investment of 1.24 billion yuan and the airport was expected to start operation in 2015. I personally have not heard of this airport being open as of 2017 but I am sure that when it does its flights will not be terribly cheap but will allow those with a good traveling budget to avoid the 10 hour drive it takes from Xining to Dawu. The airport will have a 4,000 meter runway (Class 4C), and a 3,000 square meter terminal building. It is projected to handle 150,000 passengers and 375 tons of cargo annually by 2020. I had been planning this trip for months and yet somehow it was still two days before the scheduled departure date and I still had no idea if I was going or not. This is not the usual way I run things; usually trips are booked complete with guides, hotels, transportation months before and all the ducks are in a row. But sometimes on the high Plateau you have to be flexible. Especially when you are traveling by yourself to scout out a future trip. The cause of the delay in this case happened to be a tiny fungus. I had been contacting my local guide friends for months and had been asking them about going to Nyenbo Yurtse. 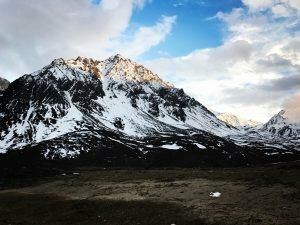 I had seen pictures and blogs and heard that this was an epic hike amidst shark-tooth snowy mountains and crystal-blue alpine lakes and I wanted to experience this myself. So I made a plan. I would take my family here – including my 5 year old and 3 year old children. They would ride on horseback over the high pass at 15,000 feet (which is high but has a fairly gentle grade) and my wife and I would carry backpacks full of supplies. Since we had trekked to Annapurna base camp in the last years with our family in Nepal, we have wanted to take our kids out into the mountains for another go. 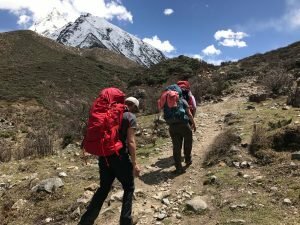 In walking the 8-day Annapurna Sanctuary trek we had stayed in teahouses and had carried our kids on our backs in baby backpacks and the kids loved being in nature after a long time of being surrounded by concrete in a city in western China. Rose and I had started our marriage and honeymoon by walking 2,650 miles from Mexico to Canada and backpacking was a big a part of our life together and our mutual passion as a married couple. So it was naturally important for this passion for the natural world to overflow out to own kids. Now they were old enough they could get to some fairly high places, walk a little, and appreciate the wonder around them. So since that last big trek in Nepal, I had been scheming about how to get our family out. Nyenbo Yurtse seemed like a perfect way to do that. And I knew we could hire a horse and guide so it seemed like a sure fire bet to be able to bring them along. As an outdoor adventure and trekking business on the Tibetan Plateau it is my job to to get out and find some of the most off-the-track, inspiring destinations in the wilderness. I like to go to these places myself first and then look at the trip from the eyes of potential clients to see how food and lodging and logistics all can work out to make the best, highest quality trip possible. From all the rumors from local nomad friends, Nyenbo Yurtse was a must-see and offered some of the most stunning views and best trekking around. 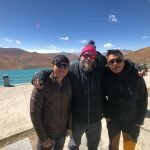 I wanted to add this trip to our offerings not only just for the clients who would come, but as another way to build bridges to local Tibetan communities to help out their local guides, horse men, hotels, and taxi drivers. As with every Elevated Trip, community impact was as high on our priority list as was serving an excellent, unique experience. 3.) It was my 36th Birthday! I have made it a tradition to celebrate my birthday in the wilderness. Last year I went camping by myself amidst beautiful red rock gorges on a grassy mountain overlooking 14,000 foot LaJi Mountain. I wanted to celebrate and look back on my short life on this earth by enjoying it untouched beauty. And it just so happened that the weather forecast looked pretty good for June 6! So I had good reasons for going. And I had dates set in motion. The only problem was that I had been contacting my local guide friends in the area and none of them could seem to be able to book in a horse guide. This was an essential part of the plan to be able to get my kids over the high pass because there was no way these kids were going to be able to walk 30km over 3 days in the mountains on their own two feet. I sent several phone calls and emails and never heard anything back from my local contacts. Then it got to be about a month before the expected departure on June 2 and I still had no guides or pack horses definitely lined up. So I called my guide friend again and he said, “Sorry. I just can’t find any guides for you right now. They are all out in the grasslands picking caterpillar fungus.” I asked many other foreign and local friends with connections around Nyenbo Yurtse and they echoed the same reply. EVERYONE from middle school students to middle aged dads was out in a money-making caterpillar fungus CRAZE! But first let me explain. Caterpillar fungus, known as Ophiocordyceps sinensis, is considered by wealthy Chinese as an important traditional Chinese medicine, especially as an aphrodisiac. O. sinensis parasitizes larvae (aka caterpillars) of the ghost moth family and then germinates in the larvae, kills and mummifies it, and produces a fruiting body that is like a tiny stick that emerges from the corpse and stands upright, poking like a tiny pencil tip a few centimeters out of the ground. The fungus is ground into a tea or powder and taken either as pill or is drank as a tea. This fungus parasitizes a specific species of high altitude caterpillar that is almost only exclusively found in the Himalayas at altitudes primarily between 3,000 to 5,000 meters in the mountains and so Tibetans and Nepalese mountain villages have a good corner on the production. Tibetans call the caterpillar fungus “Yartsa Gunbu” and in rural Tibetan economies with few sources of income besides yak and sheep, this is a very big deal. In rural Tibet, the fungi contributed to 40% of the annual cash income to local households and 8.5% to the entire GDP in 2004- and the market has been growing quickly since that figure 13 years ago. In 2008, one kilogram of caterpillar fungus sold for between $3,000 USD (for the lowest quality specimens) to $18,000 USD (for the best quality larvae). These days in 2017, a kilogram could sell for as much as $75,000 USD in the upper end of consumer markets in Beijing or Shanghai. rich pasturelands of their yaks. Given the incredible (and very strange) economic boom of caterpillar fungus, it is no mystery that not a single horse guide could be found at this time for me. Every single Tibetan horseman would consider my usually generous standard guide fee as small potatoes compared to the money he and his family could make by digging up the fungus. If I had been looking for a guide in July or August or September this would not have been a problem. But in late May and early June, It was like trying to find a needle in a haystack. And so, after about 20 phone calls, emails, texts to a multitude of friends, I was sitting two days before the trek without a horse guide. I had held out hope we would find a horse guide but now it was crunch time. And this meant things were not looking too good for my family to go trekking in Nyenbo Yurtse. I talked it over with my wife. We had been traveling a lot and had just spent 2 months in about 6 different states in America. She said she would like a break from traveling but she gave me her blessing in being able to do the trip myself. So I made a last minute decision. After months of planning the itinerary as a family trip, I would go to Nyenbo Yurtse myself. If I had to I knew I could carry my own 40 pound backpack if there were no guides to be found. So I called my friend, Phil, and asked if he was up for a last-minute adventure to hike Nyenbo Yurtse. We gave Google Earth a search and we looked at the trail and the mountains and figured at least the first half along the alpine lake looked straight forward (after that we were not exactly sure which pass we were supposed to cross but figured between us we could ask someone in the trailhead mountain town to figure it out along the way). His wife, amazingly, said he could go and we set the departure time for June 2 morning. We did not even have the departure time or confirmation of going until around June 1. This was probably the most last minute trip I have ever been on. I packed and we set off on June 2 morning. This is the route we took and this is exactly how I would recommend getting there to and from Xining. We drove 239km from Xining, the capital of Qinghai Province to Labrang in Gansu Province (Xiahe in Chinese) over 5 hours. In Xining we started out at 2,300 meters and worked our way up to 2,900 meters in elevation in Labrang. This drive, just a few years ago, used to take 8-10 hours to navigate horribly muddy and pot-holed roads (and the trucks broken down in the muddy pits along them) that were especially difficult to drive after crossing the bridge over from Qinghai to Gansu Province. However, now there is a raised highway between Xining and Rebkong (TongRen in Chinese), which is roughly the halfway point to Labrang. This section from Xining to Rebkong is very fast with multiple newly built tunnels that run for a few kilometers directly through mountains and now only takes about 2.5 hours and offers excellent views of the emerald waters of the Yellow River. Once in the heart of the Gansu grasslands in Labrang we continued south another 103km, or 2.5 hours, to Luqu, another small town in the grasslands. Luqu offers little in terms of interest for visitors but has some nice noodle shops and makes a good lunch stop along the way for hand-pulled noodles. After Luqu we continued another 80 km, or 2 hours, south to Maqu. 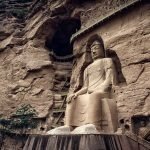 The town of Maqu is seated right on one of the first bends of the Yellow River and we visited a small monastery with about 100 monks just 2 km north of Maqu town. The monastery is quite small and we found there was not very much going on in terms of activity in the monastery but was still interesting to explore the mud-daubed houses of the monks as well as the main temple hall. The highlight for us in this monastery was walking to the top of the hill where the former monastery ruins were and looking down on the town and the large bends of the Yellow River as it winded in and out of the grasslands below us with very dramatic twisting curves for as far as the eye could see. 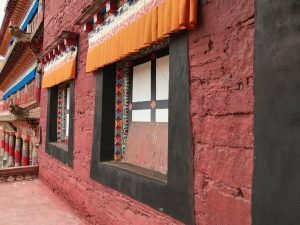 The monastery outside of Maqu is 3,600 meters in elevation while the town itself, as a central region of the Golok Tibetan tribe, is around 3,500 meters. We left Maqu in the morning after a nice Tibetan breakfast of yoghurt and Tsampa and drove for our last and final stint of 5 hours to Jigdril (Jiuzhi in Chinese). After two days of good driving on well paved roads, we were in for some harder driving today as we crossed over the Yellow River two times. The drive from Maqu to Jigdril turned out to be only about 4 hours, but 2 hours of this time was spent going 20km/hour or less on very bumpy dirt roads. These roads will likely be fully paved in the next two years but until then, this is a backcountry road that is under repair and, in wet conditions, it would be best to have a good 4WD vehicle to navigate some of the longer sections of inches-deep mud and potholes. We arrived in Jigdril in early in the afternoon. Jigdril town, at 3630 meters, is the on Qinghai side of the border of Sichuan and Qinghai Province. From here it is only 75km to the south to the town of Ngawa in Aba Prefecture in Sichuan Province. If one were to drive from Chengdu, rather than Xining, you could drive from Chengdu to Barkam, Barkam to Ngawa, and then Ngawa to Jigdril over 3 days. 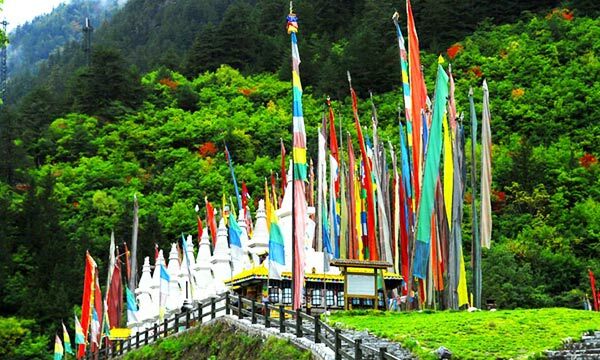 Jigdril County, one of the 6 counties of the Golok Autonomous Prefecture, has an average elevation of 3,800 meters and is most famous for the incredible peaks of Nyenbo Yurtse National Park. Once we settled into our hotel, we hiked up from the main street of Jigdril and crossed the local river outside of town to gain about 200 meters in elevation to get a better view of the town. It was a great warm up hike and from here we got our first views of the Nyenbo Yurtse mountains, hovering just 50km from Jigdril town. The rain and fog cleared just as we crested the grassy hill and the peaks of Nyenbo Yurtse, now covered in fresh snow were gleaming against the blue sky and then new rays of sun. I was getting my first views of the mountain and I was getting very excited! 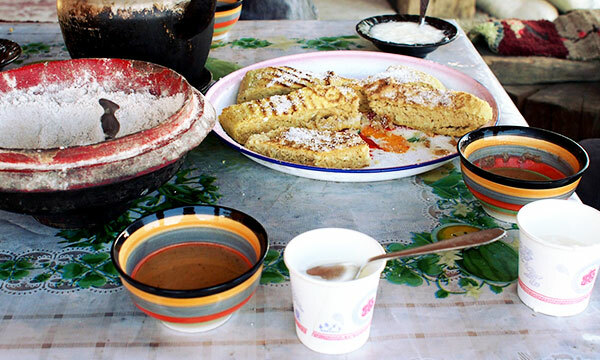 We had a quick breakfast of dumplings and tea eggs at a local restaurant and got a taxi to drive us to the Nyenbo Yurtse trailhead. The drive took about 1 hour from Jigdril town (which cost us 150 RMB for a one way trip in a local taxi) and took us over two spectacular high passes, both filled with prayer flags set against new fallen snow. AT the the entrance of Nyenbo Yurtse National Park, we paid 120 RMB per person for our entrance tickets. There is a boardwalk here with a few Chinese tourists, but most of these don’t venture more than a few hundred meters into the park. The trek starts on this boardwalk and winds to the the left of the the alpine lake. The trek starts at 4,026 meters and for the entire 10 km of the first day of the hike, you maintain this elevation as you walk for 6km along the lower alpine Shuntso Lake shore and then another 2.5km along the upper Shuntso Lake that flows into the lower lake. In our case we actually walked on the path to the right of the lower lake because it had just been raining for 3 days straight and the trail to the left of the lake (usually the one used by trekkers) was said to be very mucky and slippery by our horse guide. There is actually a circular pilgrimage (and thus good trail) around the whole lower lake. So this was no problem. However, in walking the path to the right of the lake we came to the small river where the upper lake flows into the lower lake. We had to take our shoes off and wade up to our knees across about 20 meters of fairly shallow, icy water to cross to the main trail. This was not a problem for us but I imagine this is why most trekkers start on the left, rather than the right, side of the lake. From the very first moment the hike is stunning. On most hikes you have to gain a few hundred meters and hike 10km or so before you get into the really spectacular scenery. But as soon as you step into the park, there are huge rugged peaks right before your eyes tucked right behind the shores of the turquoise alpine lakes. 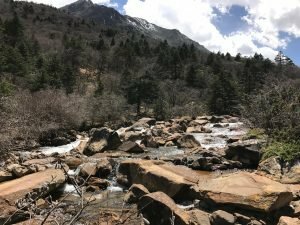 This hike is very unique because you gain zero total elevation on the first day and yet have incredible views and rewards all the way. Even if I had not done the three day trek, I still would have made the 3-day, fifteen hour drive down to the park AND paid the high park entrance fee, just to spend one day around the lower shores of lower Shuntso Lake. It is absolutely fantastic to walk along the shores of lower Shuntso Lake and listen to the waves gently lapping against the beach shores with an incredible backdrop of dramatic cliffs. It makes for a very relaxing and wonderful hike and there is no sudden uphill to shock your system into the wilderness on this first day. After 10 km of walking along the lower and upper lakes camp at upper Shuntso Lakes we arrived at the top of the upper lake and made our camp here. It was very windy here and as soon as we arrived a snow storm blew in. We scrambled to set up our tents quickly in the hail and the snow. Within 20 minutes the storm blew through and the sun was reappearing again to reveal an incredible snowy mountain behind our camp against a bright, clear blue sky. At our Camp 1, we cooked dinner, made a small fire from some scrubby bushes along the lake and went to bed after a very satisfying first day in the mountains. Departing the upper lake from Camp 1, we ascended 200 meters over a gently sloping sheep trail about 3km over a small pass that was tucked back and to the left of the valley we slept in. From the top of this pass you curve in left enter a large boulder field with scattered truck-sized boulders that are littered throughout an alpine grassland. The trail then flattens out a bit for 1km and you walk further back into a gorgeous alpine valley with sharply pointed peaks all around you. Once you walk into the heart of this valley there are two very clear passes (both of which had snow on them as of June 6) as the valley floor splits into a “Y”. Take the path as it leads to the left and continue to ascend this pass via a sheep trail. I inquired about the pass on the right of the valley and our guide said it was both too steep and too snowy to cross and front the looks of it I fully agreed with his assessment. From this “Y” in the valley – this is where the hike got quite challenging. We would now ascend the final 300 meters to the high pass over about 1 km. This is the steepest and most difficult part of the whole hike. The trail rises at about a 7% grade up into the snow-covered, rocky pass through 2 “false summits”. While this grade is not, in itself, particularly steep or dangerous, it is enough of an incline that it gets the heart beating at such a high altitude climbing from 4,200 meters to 4,500 meters. This is where we were especially glad that we had hired a pack horse and horse guide. Getting up the pass was difficult work with a day pack and I can only imagine how tough it would have been with a full, 40 pound backpack full of a tent, food, and sleeping equipment. Today was also my 36th birthday and I could not think of a better to have spent it! It was absolutely one of the most spectacular things I had ever seen. Crossing the high pass in ankle deep snow was exhilarating. The sun was bright and we could look down the valley to several towering spires, each shooting off the main ridge of the mountain like an arm sticking upright into the cold, clear air. The high pass was higher than any point in the entire 48 United States and all but the 5 highest peaks in all of Europe. The weather could not have been more perfect. Up here it would be very easy to get snow or rain but we were bathed in the warm sun and could see in all directions. From the prayer flags and the yak skull on the pass we descended another 4km to our tent site on an upper slope of a third alpine lake. This is where we made Camp 2 at around 4,100 meters. From here, at this nomad camp, we had an incredible sunset over the mountains with reflections glimmering below in the 7km crystal blue alpine lake. 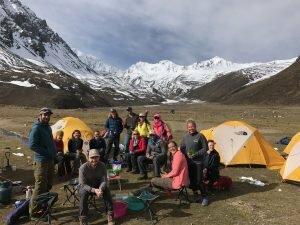 This was a great tent site and we enjoyed a dinner of warm pasta with our Tibetan guides after a long and epic day walking across the pass. We woke up in the morning and descended over 4 hours about 12km past the last lake to a small cement road in the back end of Nyenbo Yurtse National Park. We had arranged a 2pm pick up with our previous taxi driver and I think I hit the parking lot at exactly 2pm – so that was pretty good estimation as far as timing. Coming down off the mountain and skirting this last and longest lake of the hike, I felt excited and energized. I was like a horse heading home to the stable. I was ready for a good warm meal, a hot shower, and clean cotton sheets and now I was only a few kilometers from finishing the trek. I barely stopped, except for a few times to take pictures. The trail was flat or downhill and the views of the long lake were invigorating. I got a good deal ahead of my friends in my excitement and arrived at the outflow of the final lake at least 30 minutes before them. I laid on the grass overlooking the lake under the heat of the high altitude sun and took in the last three days of hiking now behind me. Given the good weather (and the fact that no one else was around) I decided to take a quick naked swim in the lake. The blue color of the lake was just so inviting that I couldn’t pass up this opportunity to finish the trek off with a cool dip! I gingerly walked with my bare feet over shrubs and sharp rocks along the shore, found a small beachfront, and dived into the chilling water! I was probably only in the water less than 20 seconds! It was all direct melt from the nearby glaciers and it was some of the coldest water I had ever been in. I think it was just about the same temperature as Guitar Lake at the base of Mount Whitney in the Sierra Nevadas of California – at least from my memory of that freezing experience! I rushed out of the lake and let the sun evaporate the cool water droplets off my body. Just as I was exiting the lake, I saw my friends turn the corner of the trail and approach me. They had caught up much quicker than I had anticipated – just soon enough to catch glimpses of me shimmering and diving into the frigid waters. Inevitably at least one of my friends took a picture of me swimming for good measure. I put my clothes back on, ate a terrific picnic lunch on the shore, and we set off for the last few kilometers of our hike. We could now view the cement road in the distance and it seemed like only a stone’s throw away. We were practically home! I figured this was going to be easy-peasy! But, as I arrived in the parking lot, I was totally spent. My high energy and enthusiasm from hours before had waned significantly. Now I was baked in the sun and felt like I was walking away from one of my high school wrestling matches – having left every ounce of energy in the arena. The sun and the work finally caught up to me and my legs were starting to feel quite tired and a little shaky. Another reason for my exhaustion was because of the terrain in the last section. I had just spent the last 1.5 hours traversing a wetlands marsh and hopping from grass clump to grass clump to try to keep from plunging into the soggy mud that surrounded the Nyenbo Yurtse river basin. The high amounts of precipitation that fell in the week previous to our trek had left this latter trailhead an alpine bog as the little streams flowing into the larger river had swelled and overflowed into all the surrounding grasslands. The whole ecosystem below my feet had become one interconnected swamp; when I stepped on one part of the grasslands, the whole thing tumbled and shook in other parts sending a ripple effect throughout the whole rooted, soggy mass. There were times I had to walk 100 meters off course just to find a place where I wouldn’t sink too deeply into the mud. It was all a good deal of mental work for what I thought would have been flat, easy walk. We paid our horse guide and exchanged contact information. He was now going to do the entire 3 day trek in reverse (in less than one day’s time) to return to his family tent in the next valley and to continue his labors to find and pick the treasured caterpillar fungus. As for me – I was tired but felt well rewarded. The Nyenbo Yurtse trek had been a truly enthralling birthday event and I could think of few other times in my life when I had felt so alive and so joyful. Despite the mud and the hard work, it had been so worthwhile to do the trek and I couldn’t stop scrolling through my pictures because it was almost hard to believe that I had really been in such a beautiful place with perfect weather. Now it was back to the hotel in Jigdril for a night of rest! This was definitely one of my best birthdays to date! This was the long drive day. I had driven to Nyenbo Yurtse in 3 days and we were heading back to Xining in 2 days. This meant a 10- hour driving day through incredible grasslands (particularly famous for their high quality, fresh yak yoghurt). The road took us back into Gansu Province and then winded off to a newly paved road back into Qinghai Province. Throughout the journey, I picked up a few different hitch-hiking nomads. I had an extra seat in our car and I figured they did not want to walk back home another 25km in the rain. We stopped for the night in Henan town in Qinghai Province. This was a slightly surreal Mongolian resettlement town in the middle of nowhere. The buildings were all made in the cheap-concrete communist fashion that is so endemic to most grasslands communities on the Plateau. But each building- looking like it was crumbling and falling down after only a few years of use- bore some characteristically Mongolian symbols, especially the blue and white eternal knot and other interlaced motifs. All the signs bore 4 different languages: Mongolian, Tibetan, Chinese, and English. The English, or “Chinglish” was a real highlight. I couldn’t find a single storefront sign that made 100% of sense. Most were just badly translated attempts at English phrases form technology that had not caught up to its place in time just yet. “Snow mountain sand negative” (I never actually figured out what this store was actually selling). Today we drove drove 5 hours from Henan town back to Xining. Our route took us through the nomadic trading towns of Zeku and Rebkong. After Zeku we dropped down from a pass through some very scenic landscapes with forests, rivers, and old Tibetan towns. Along the way I stopped at high pass in the grasslands and spent about 20 minutes hiking up to a cluster of prayer flags flapping in the wind high over the local villages. We returned to Xining by late afternoon and after the long drive it was nice to be back home! Overall, I can’t highly recommend the Nyenbo Yurtse enough as a trek. The drive and journey there is incredible, although the last 150 km of road getting to Jigdril is quite slow and bumpy along very muddy and bumpy roads, but that is part of what keeps this destination so well-preserved and off the map of the conventional Chinese tour bus routes. As far as season, we had incredible weather on June 5,6,7 for our 3 day trek. I had decided to go in the first week of June to avoid both the rainy season and higher rates of Chinese tourists that travel to Nyenbo Yurtse National park in the summer months of July and early August. This was a great decision in terms of weather and having almost the entire national park to ourselves. Once we got past the first 100 meters of the first alpine lake at the park entrance, we only saw a few local nomads out picking caterpillar fungus in their own home turf. However, I can’t recommend traveling to Nyenbo Yurtse as a trekking destination in early June because, as you have seen, that is the high caterpillar fungus season and it was very difficult for us to find a horse and horse guide who were able to carry our backpacks for us up the mountain. Ultimately, the trek could be done without a horse to pack in our backpacks but I think this would have significantly made the high altitude ascent extremely exhausting and would have taken away a lot from the enjoyment of the beauty. I think most people would have a great struggle to carry their own tent, food, and clothing up a 4,596 meter high pass. The trail is probably never more than a 7-8% grade in slope, but the last 3 km leading to the high pass are very fatiguing because of the lower available levels of oxygen and the continual upward slope. For the best season I would recommend trekking Nyenbo Yurtse in late August (when some of the Chinese tourists have returned to their big cities) or in early September, when the weather is chilly but likely clear. 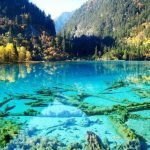 I think it is very reasonable to follow my same route in taking 3 days to get to the trailhead, 3 days for actual trekking, and 2 days to return to Xining or Chengdu. As of early June 2017, foreigners are allowed to stay in these restricted areas but have to sleep in very specific hotels in town that are registered with the police to be able to officially host foreign passport holders. These are the same hotels that we used on our trip. Do not be surprised if the police personally come visit your hotel room or need to check and copy your passport in these areas. In Jigdril, police came into our hotel room at 9pm at night just to check our belongings and register our passports. In Henan, we actually had to make copies of our passports and drive to the police station across town to register. In these restricted places, it is very common to be asked to register in such a manner. 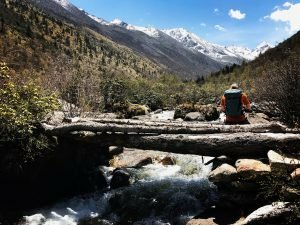 This bridge in relationships, along with the obvious route finding help on the Nyenbo Yurtse trail, is one great reason I recommend using a local Tibetan guide along this journey (as we at Elevated Trips always do) so that these procedural encounters with the local police are smooth and easily managed. Discover the secrets to this mysterious mountain in this blog post about trekking routes in the region. 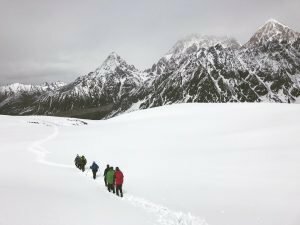 In this post we discuss the best seasons to hike this beauty as well as what to expect in a play by play journal of the 6 day trek up to the Riwuche high pass at 4,875 meter (16,000 feet). 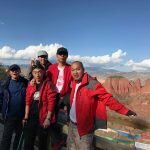 On May 11, 2017 I set out with a group of experienced Outdoor Adventure students and staff from a Canadian college for a wilderness expedition to trek Minya Konka, otherwise known as Mount GongGa in Chinese. For Tibetans, the taller the mountain, the more powerful the deity that lives on it. So, by it’s very size and mass at 7,556 m (24,790 ft), Minya Konka is of huge spiritual importance to Tibetans. The SummitPost reports that until 2003 the mountain was successfully climbed only eight times. In total 22 climbers have ever reached the summit in known recorded history. 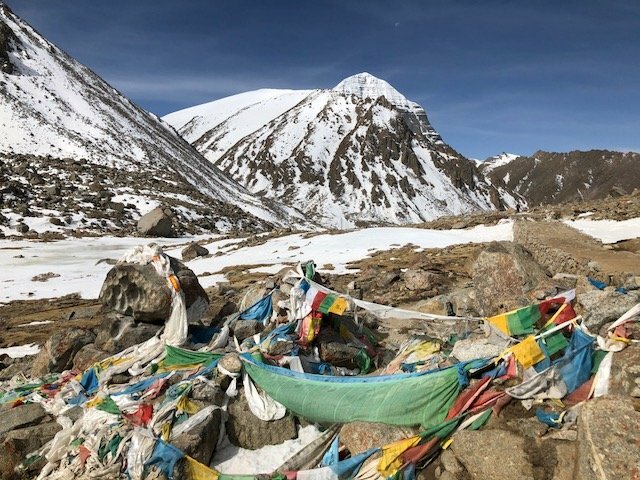 While summiting its peak is off-limits to all but the most experienced of mountaineers, there is a more accessible trail which winds around the west of the mountain, following the sacred pilgrimage kora undertaken by many Tibetans each year and this allows for some very stunning trekking. At this time of year we also found that there were many local nomad families out picking caterpillar fungus. While each caterpillar fungus is very hard to spot (as little more than just a brown pencil-thin bump in the soil), they can fetch $3- $20 USD per fungus depending on size and quality. And that is the price just at the base of the distribution pyramid. Once these get to high end markets in Shanghai and Beijing, Chinese consumers will pay great sums of money for this traditional Chinese herbal medicine that only grows in the high Tibetan Plateau. 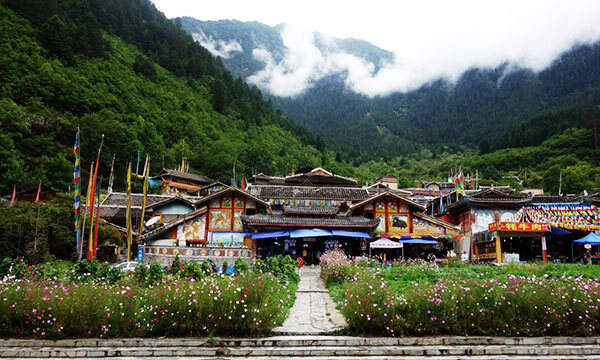 The starting point of the Minya Konka kora is just a short 30 minute drive from Kangding; however, we recommend spending a few days in Kangding town (2,560 meters or 8,400 feet) to acclimatize to the altitude before starting your trek. 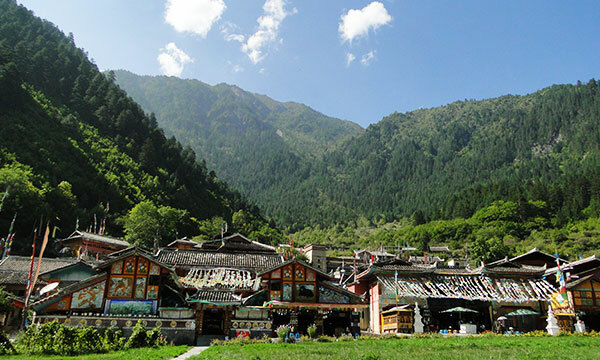 The traditional through-trek route takes you past Gongga Shan, along the stunning snow-capped Daxue Shan range of mountains which lie to the east of the trail. It’s possible to start your trek either from the north (Laoyulin near Kangding) and head south (Zimei), or from the south working your way northwards (see below map). 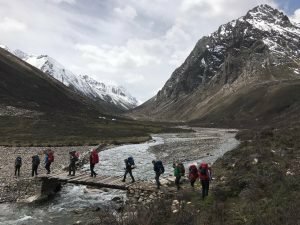 For our trip, we decided to start out at Laoyulin valley nearest Kangding and only go to the high pass at upper Riwuche (listed as “Shang Riwuqie” on the map above) at 4,876 meters or 16,000 feet and then retrace our steps back to the Laoyulin trailhead. We made this decision on the basis of the snow pack at the top of the pass. As we approached the high Riwuche pass, we were about 50 vertical meters from the top and we were already up to our hips in deep snow. The presence of cornices at the pass along with the deep snow discouraged us from going further so we turned back, happy to have gotten an incredible view of the glacier and the 6,000 meter/20,000 foot mountains all around us. However, we did see two Chinese trekkers go over the pass (and apparently complete the entire through trek). Both of these brave individuals had full 40lb backpacking packs on and had a great deal of trouble getting through the thick snow. But after hours of work struggling up the pass and postholing in the deep snow, we saw them disappear over the saddle of the pass and make it through the cornices. However, I would not recommend doing the through trek of Minya Konka in early May. If you were wanting to do the entire through trek from north to south or vice versa you would want to attempt this in the months of July, August, September and this would provide you with green valleys and a clear path across the high pass. Here is a record of our group’s schedule as we trekked Minya Konka. We arose at 6:45am in our cozy hostel so that we could get down to the bus by 7:30am. Due to construction on the road leading to the Laoyulin trailhead, we wanted to get to the trailhead before 8am, when the construction starts and it is difficult to get by the many machines paving the road. 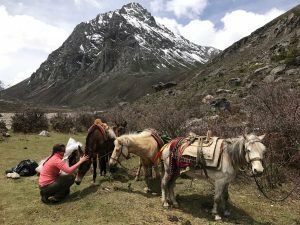 We arrived at the trailhead at 3,200 meters/10,498 feet and packed our tents, cooking gear, and our food on 4 small Tibetan ponies. Carrying only our personal belongings and sleeping bags, took off on a small dirt road that wound past a small dam facility. Within 3km, the road gave way to a proper trail and we were making our way through the rain. After 7km of soggy hiking from the start at the trailhead, we passed the first pasture where it is possible to camp at 3,600 meters/11,811 feet (listed as “Dacaoba Camp” on the map above) and opted for a quick and very cold and miserable lunch under the slight protection of a grove of trees just outside the pasture. We had considered camping here, but the rain and the snow caused us to go on to stay warm through movement. By this time it was snowing and we were all very cold any time we stopped on the trail. After lunch we hiked another 8km in rain and snow and walked along the banks of a surging snowmelt river littered with lots of red rocks and dramatic boulders set against boreal forests and high cliffs. At around 4pm we arrived at the second pasture at 3,900 meters/12,795 feet (listed as “Riwuqie Gou” on the map above). Fortunately, the precipitation let up and we had a chance to warm ourselves by the nice fire our Tibetan guide had made for us. We quickly set up our tents and got warm, dry clothes on and made a warm dinner of curly pasta and sausages . It felt good to get some hot food in us and to sleep in nice 0 degree Celsius down sleeping bags. After a breakfast of granola and powdered milk, the sun came out and allowed us an incredible view of one of the nearby 6,000 meter/20,000 foot peaks. We all took scores of wet clothes and hung them up on every rock, crag, and gnarly little thorn bush we could find in a desperate attempt to get the wet contents of our bags bone dry. For the most part, it worked out well and we all had dry clothes for the rest of the trip, especially because the rest of the trip was filled with good weather and sunbeams and blue skies over the mountains. We had a lazy morning packing up our tents for the first time together and breaking camp. We stayed in Camp 1 long enough that we were able to eat both Breakfast and Lunch there and then departed for a short 3-4km walk up the valley. The trail continued to have a very shallow, gradual grade as it had for the last day’s walk. This was certainly a big advantage with 20lb packs and less available oxygen as we gained elevation. We crossed the river on a sturdy log bridge and made our way past Tibetan nomad tents pitched by entrepreneurial Tibetans looking to cash in on the 3 weeks of opportune caterpillar fungus picking. Around 3:30pm we arrived at our camp 2 at 4,100 meters by pile of “Labtse” or stones that have been thrown into a pile to appease local mountain and water spirits. This stone pile, although very different in purpose, looked remarkably like a western cairn which serves at a high altitude trail marker. We set up our camp, filtered water, and had a glorious supper of pasta with cabbage and cauliflower, carrots, and red curry. After a relaxed day of hiking, a good debrief and a good dinner, we felt revived from the way the weather had worn us down the day before. We ate breakfast and broke our Camp 2 at lower Riwuche valley (listed as “Xia Riwuqie” on the map above). Like every morning, we had to tie the tents and luggage in a special way so that each bag or box could be tied to the side of the wooden saddle on the ponies’ backs. From there we walked another 4km up to the upper Riwuche valley to arrive at Camp 3. More gentle slopes greeted us as we made our way from one valley floor to the next. As a tip to anyone trekking up the valley from north to south as we did, I would suggest for you to stay right of the river until you get to a small wooden log bridge. We happened to cross the river a few 100 meters too early to the left side and it cost us about 30 minutes in travel time as we bushwhacked our way through brush and uncut trail. We were never in danger and the result (getting to the left side of the river) was the same. Just before crossing into the upper Riwuche valley (listed as “Shang Riwuqie” on the map above) , we ascended a sandy slope that reminded me of sand dunes and once we were over that last hump the entire upper Riwuche valley opened up to us and we were surrounded by monstrous 6,000 meter (20,000 foot) peaks on all sides. The entire trek had been gorgeous, but as we made this last push it became evident that it just kept getting more unreal. We set up camp quickly and half of our group made a quick push to the edge of the glacier lake while the other half rested and worked on dinner. It took us about 1.5 hours to get up to the rim of the glacier lake from Camp 3. The first 45 minutes was spent traversing relatively flat terrain and navigating the braiding branches of the river and its snowy banks. Then we ascended steeply up through a rocky gully that forked to the left of the valley and clambered across boulders to the rim of the glacial lake. Surprisingly, there was only small patches of 3-6 inch snow as we crowned over the rim so the hiking was very manageable and at no time did we posthole in the snow. On the rim we were right at 4,572 meters (15,000 feet). We were taller than anything in the 48 United States and, boy, were we feeling it! We all huffed and puffed to get to the top but it was so worth it! This, for me, was the absolute highlight of the trip in seeing the light of the coming sunset piercing through the blue edges of the glacial ice across the lake. The lake itself reminded me of Crater Lake in Oregon in the winter- a high craggy rim that encircled a snowy crater below. But the backdrop was Denali itself in a rugged alpine stark beauty. It was the kind of wonder that we were all seeking on the trip; the kind of grandiose scene that makes a man feel very small against jagged and fierce cliffs that could wipe him from the face of the earth in just one fervent blast of wind. Even the high trail along the ridge of the lake was a knife edge. It was the kind of trail that allows for a foot or two of width in safe passage but everything on either side looked like a long and dangerous drop. Our turn around time arrived. After a few jumping pictures on the rim, we weaved our way in-between boulders and snowpack. We descended back to camp 3 and wound back down to the mouth of the lake as it poured gently back into the valley and became a rushing river that surged under a icy veneer. Within 1 hour of departing the rim of the glacial lake, we were back in camp. And we exhausted. Thankfully, a hot dinner awaited us. We ate our fill, cleaned up dinner, and headed for the horizontal position in our sleeping bags. A snow storm was starting to blow up and none of us were too keen to linger too long outside of the tent at 4,300 meters/14,107 feet. I promised myself as I went to bed the former night that the next day was definitely going to be a rest day for me. I had felt I had really experienced my highlight of the trip in the glacial lake and I was up for rest day at high altitude. I was starting to experience a headache and had developed some diarrhea, so I figured I could use some rest from pushing myself the day before. I told my co-leader that I was happy to stay back in camp that day and just watch the tents, pump water, and cook food. That was my plan as I exited my tent into 5 inches of thick freshly fallen snow on the morning of May 14. It seemed like a perfect day to listen to the birds flitter and chirp away as the sun melted the snow that covered our tent. But that plan for rest totally failed. What was proposed for the day was a quick one hour jaunt to a nearby saddle from Camp 3. I figured I could manage such an easy and quick hike from our camp and then be back to have a full and restful afternoon. So I put on my clothes and my gaiters, anticipating a short and non-eventful foray within a stone’s throw of our camp. But then the fog came in right over the saddle that we were aiming for. And as soon as that fog settled in behind us, the sun, at the same time, came blaring through the clouds and revealed a brilliant blue sky directly above us. We all instantly threw off our fleece layers and merino base layers and within 3 minutes we were all standing in fresh snow in our short sleeves. This changed everything. Now the saddle didn’t seem so inviting and it certainly wasn’t going to provide any new or interesting views in that fog. But the pass – the highest pass of the entire hike- looked clear and sunny and inviting. In those 3 minutes our plans changed. We weren’t going up just 50 or 100 meters. Our group was going for the holy grail – climbing 600 meters to a pass that we were not sure we could make it to. I told myself I was going to turn around half way and come back to camp early. At least that is the way I rationalized taking advantage of the weather. But by the time we were half way up, the weather was clear and overcast (which was good because the snow was not too bright) and I could see the high pass. It didn’t look so far and the snow was surprisingly manageable. Most importantly, no one else was turning around and going back to camp. So neither was I.
Inevitably we quickly gained on the hikers, to find they had full backpacks and were planning to cross the pass and carry on the rest of the way to Zimei village on the other side of the pass. We only had slight day packs with water and snacks and we were struggling to make it through the snow. I can only imagine what was going through the minds and bodies of these two poor Chinese trekkers with full packs. Every step they took sent them belly deep into an abyss of snow to then struggle and shake and flail their way out of a deep hole like an overturned turtle escaping a ditch repeatedly . But they were determined to make it across the pass. In fact, one of the trekkers was so Gung-Ho that he refused to follow his friends hard-earned footprints and instead went all “Lone Ranger” to try to blaze his own trail. In snow that is 1-2 meters deep, I can not possibly comprehend why anyone would waste so much time and energy trying to make their own path when there is 30% less oxygen available than at sea level. It was an amazing example of pride and independence that could have really hurt or endangered this trekker. I wasn’t the only one worried for these two. Their Tibetan guide gave them directions on which way to cross the snow to navigate the cornices and the narrow pass. Then he turned around and went back, leaving them on their own for the rest of the hike. Apparently he was only hired to guide half the hike and then his plan was to go back down to the valley to help the rest of his family to find more caterpillar fungus. But we watched as the Tibetan guide left his two trekkers to ascend while he descended back down the snow slope. Then we watched him turn around and make his way all the way back to the trekkers just as they were about to cross the pass. They had gone the wrong way and it was putting them in not just deep snow but considerable danger of snow or rock slides. The Tibetan guide looked back and saw this and came back to to help the two Chinese trekkers. When he came back we all breathed a sigh of relief because we were seriously worried for these guys. As we looked up to the pass, we saw the Tibetan guide help them find their way over the pass and we were happy for them that they made it. But we knew that they had a long descent down through a lot of heavy snow. It made us glad that we had decided not to do the full through trek. In light of the fact that we were in no way obligated to cross the pass, we decided to stop short at a rock pile just 50 vertical meters from the 4,875 meter (16,000 foot) pass. We probably could have made it, but we decided that it was not worth all the time and energy to just return to camp even more tired and worn out. As it was, we were engulfed in a cloud of never-ending white. And we had hit our turn around time, so we knew it was time to head back to camp. So that is what we did. Just at that moment the sun came out and started to turn the hard snow pack to slosh. And suddenly our journey in the snow became a little bit more arduous in the newly melted softer snow. We plunged and careened down back to the dirt path and rejoiced when were no longer slogging in the slushy goop snow. Somehow I had managed to do the exact opposite of rest that day. I had been to an elevation that qualified as probably the 3rd highest I had ever been to in my entire life (next to Tibet’s Everest Base Camp at 5,200 meters and another hike that took me equally as high). Once again, I was very tired from a long day at elevation. But I was glad I hadn’t turned around. It felt good to have pushed through. And it felt even better to snuggle up in my tent. We packed up camp feeling a sense of accomplishment. We had gotten much higher than we ever thought we would as a group. Now it was time to head home to the stables. We power walked out and did 17km downhill passing Camp 3, Camp 2, and Camp 1. We descended from 4,300 meters to about 3,600 meters and our lungs were happy and bursting with all the excess oxygen. We made a camp in the afternoon and had a blazing fire with all the excess wood in the forest (something that was a rare commodity in the high alpine zones of the last few days). Our knees were tired but we were all in good shape. We camped in an open pasture at 3,600 meters (listed as “Dacaoba Camp” on the map above). We ate breakfast and were out of camp by 10:30am. By 12 noon we were at the Laoyulin trailhead again. The bus picked us up and by 1pm we were in Kangding. We grabbed a quick dumpling lunch in town and then headed for a well kept secret that only locals know about: a real hot springs bath house. The hot springs flow naturally from the ground but the local Tibetans have channeled this water into a few different private and public pools. It felt so good to soak in the hot, mineral-rich water and wash 6 days of grime off our bodies and let it steam away. This was the perfect way to end an incredible walk in the wilderness.